The Oregon Rail Heritage Foundation (ORHF) has acquired the last remaining historic element of the Brooklyn Yard, a 102’ railroad turntable. The turntable, built in 1924 by the American Bridge Company, was originally installed in 1925. Before Union Pacific demolished the Brooklyn Roundhouse in 2012, the company gave this turntable to the Oregon Rail Heritage Foundation. Over the next year, the Foundation will be refurbishing and installing this vintage piece of rail history at our center on Se Water Avenue in Portland. The turntable will occupy most of the Center’s front yard at the main entrance. In addition to the installation of the turntable and its supporting equipment, the project will require reconfiguring security fencing, relocating the Center’s main entrance gate and walkway, and new landscape and hardscape. Few original turntables remain in the US. Portland is fortunate that ORHF acquired and preserved this piece of history that operated locally for more than 75 years. When installation is complete, this will be one of only a handful of powered operating turntables accessible to the public in the West, and a rare recreational and educational experience for Portland and the surrounding area. We have received a gift from the Murdock Trust that will make more of your donation! The Trust will match one dollar for every two you donate to this important project. Please consider donating to help support the turntable project. Please click here to make a donation online, or mail your donation to ORHF, PO Box 42443, Portland, OR 97242, or call the office at 503.233.1156. Thank you for your support. When you use Amazon Smile for your holiday shopping at Amazon and Amazon donates portion of your purchase price to Oregon Rail Heritage Foundation. It’s a win-win. It costs you nothing and helps us. It’s like giving two gifts at once! Follow the steps below. We thank you. Holiday Express — Another Great Year! 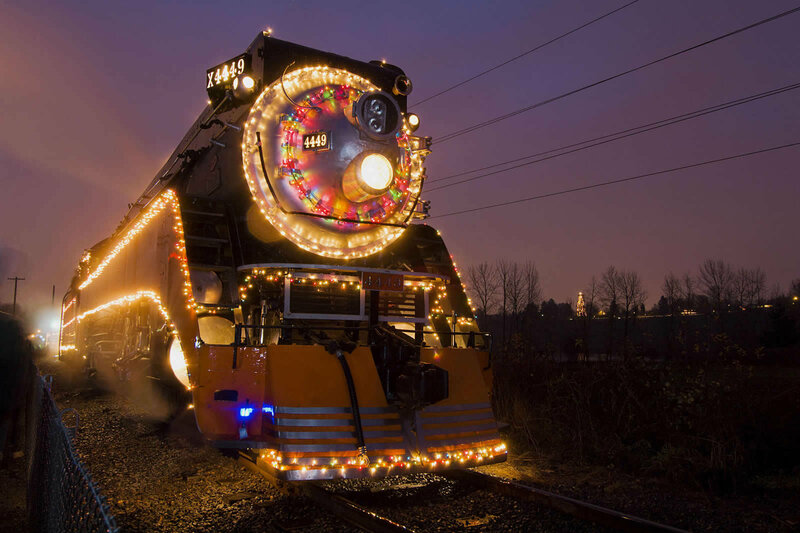 Thanks to the thousands of you that rode the Oregon Rail Heritage Foundation’s Holiday Express this year. The sold out trains filled with all ages and, or course, Santa Claus spread Christmas cheer from one end of the ride to the other. We hope all your holidays are a great success and wish you all good health and prosperity. Be sure and look on Facebook for over one hundred pictures of that special holiday joy that only comes on a train. On September 20th at the Doyle McCormack Enginehouse, the Oregon Rail Heritage Foundation celebrated its fifth birthday with food and praise. In attendance were Amanda Fritz and Nick Fish, present and past city commissioners for Parks and Recreation respectively, as well as many of the key volunteers that make ORHF possible. Fish was instrumental in encouraging the City of Portland to sign off on ORHF’s plans for a permanent home as a place to house, restore, and operate the city’s three vintage steam engines. ORHF’s mission includes a significant role in educating kids and adults as to the role steam engines played in the city’s past. Doubt from many went hand in hand with ORHF as they raised the necessary money to construct their building and meet the needs for their basic necessities. After generous donations and widespread support, the building at 2250 SE Water St. now stands tall. Greg Fitzgerald, ORHF’s executive director, opened his remarks at the gala saying, “ORHF at five is debt free, with money in the bank, and three hundred employees who work for nothing.” Cheers from the members in attendance revealed the pride of those who work on the trains and welcome visitors. The evening also revealed artists’ renderings of the expansion of ORHF’s next steps. These projects include the installation and operation of the 102 foot diameter round table from the Brooklyn Yard that is currently in storage. Making it ready to turn the engines is a big engineering and construction project. It serves a purpose beyond nostalgia. Currently the engines must travel to North Portland before turning around. With the turntable they can turn in our front yard. A capital campaign to fund the project is currently underway. The other big project is the construction of the mezzanine (see photo) inside the enginehouse to display exhibits and serve as the education center. The mezzanine was part of the original plan for the building. 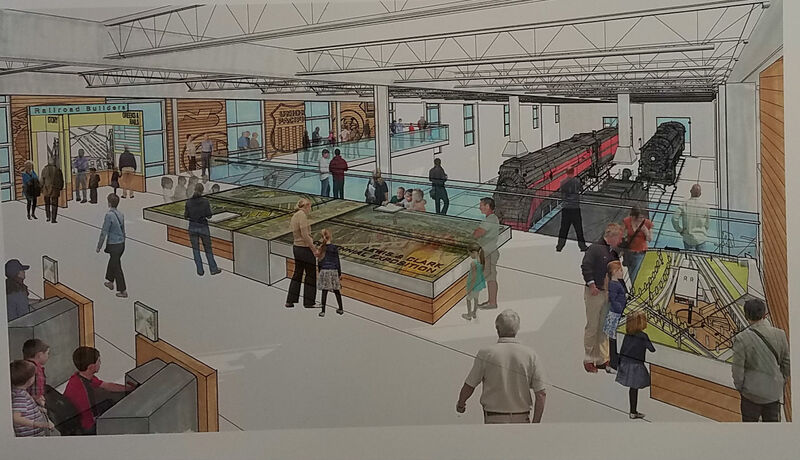 The next time you visit the enginehouse the renderings are on display. As long as you’re at ORHF enjoy our new exhibit about the World War I era harvesting of Oregon Sitka spruce to make airplanes for the war effort. This is a largely forgotten part of our state’s heritage. The exhibit will be up into 2018. The Center is open 1 to 5 Thursday and Friday, and noon to 5 on the weekend. 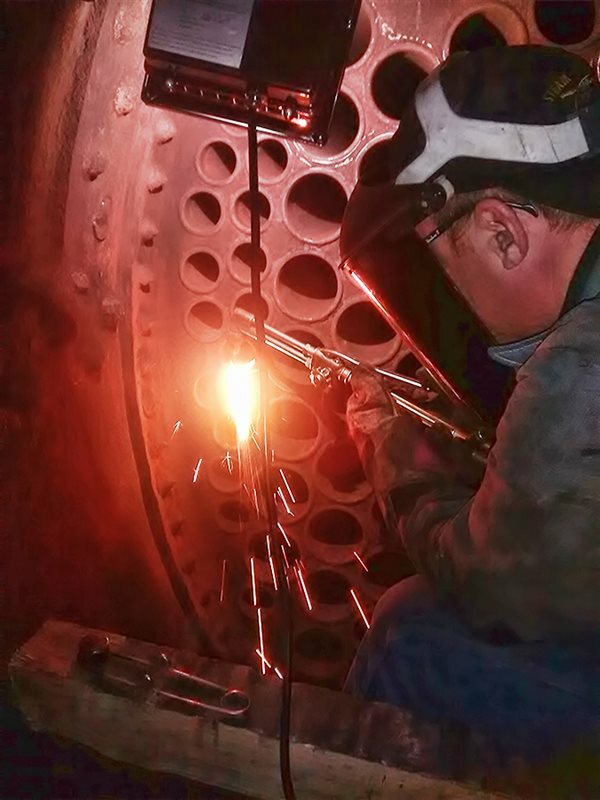 The SP&S 700 won a significant grant from the Oregon Cultural Trust to help near conclusion of the famous steam locomotive’s boiler rebuild. The 700 is maintained by volunteers from the Pacific Railroad Preservation association. To read more on this significant achievement see sps700.org. Congratulations to all concerned. Keep up with 700 updates by reading Stephen Sedaker, long-time volunteer with the Pacific Railroad Preservation Association, on Trains.com. To provide for the preservation and public enjoyment of Portland's historic locomotives, railroad equipment, and artifacts, and to educate the public about Oregon’s rich and diverse railroad history.